Postoperative pain remains difficult to control after total knee arthroplasty (TKA). While various modalities have been used, they have been associated with several side effects. For example, opioids have many side effects including: sedation, dizziness, nausea, vomiting, constipation, respiratory depression, and can lead to dependency. Recently, intravenous (IV) acetaminophen has been introduced as a method to manage postoperative pain. Therefore, the purpose of this study was to compare the postoperative outcomes of TKA patients who received oral acetaminophen versus IV acetaminophen. Specifically, this study evaluated: (1) the hospital lengths of stay (LOS) and (2) discharge dispositions. The Premier Database was used to review patients who underwent TKA from 2012 to 2015. A total of 134,216 TKA patients received oral acetaminophen, whereas 56,475 TKA patients received IV acetaminophen postoperatively. LOS were calculated as the number of days from the date of hospital admission to the date of discharge, and the discharge disposition was categorized as to home or to a skilled nursing facility (SNF). Compared with the oral group, the IV acetaminophen group had a 0.14 days shorter LOS (95% confidence interval [CI], –0.15 to –0.13; p < 0.001) and 22% higher chance of being discharged home (odds ratio [OR] = 1.22; 95% CI, 1.19–1.25; p < 0.001). Also, compared with the oral group, the IV group had a 13% lower chance of being discharged to a SNF (OR = 0.87; 95% CI, 0.85–0.90; p < 0.001). This study demonstrated that TKA patients who received IV acetaminophen were associated with a significantly shorter hospital LOS as well as being discharged home and fewer patients had to go to SNF. This may lead to a reduction in the total cost of health care, while, at the same time, decreasing the resource use in patients who undergo TKA. B.L. and E.A.B. are employees of Mallinckrodt Pharmaceuticals. R.N.H. is a consultant for Mallinckrodt Pharmaceuticals. M.A.M. and J.W.B. are paid consultants of Mallinckrodt Pharmaceuticals. A.T.P. was an employee of Mallinckrodt Pharmaceuticals at the time this study was conducted. 7 Elmallah RK, Chughtai M, Khlopas A. , et al. Pain control in total knee arthroplasty. 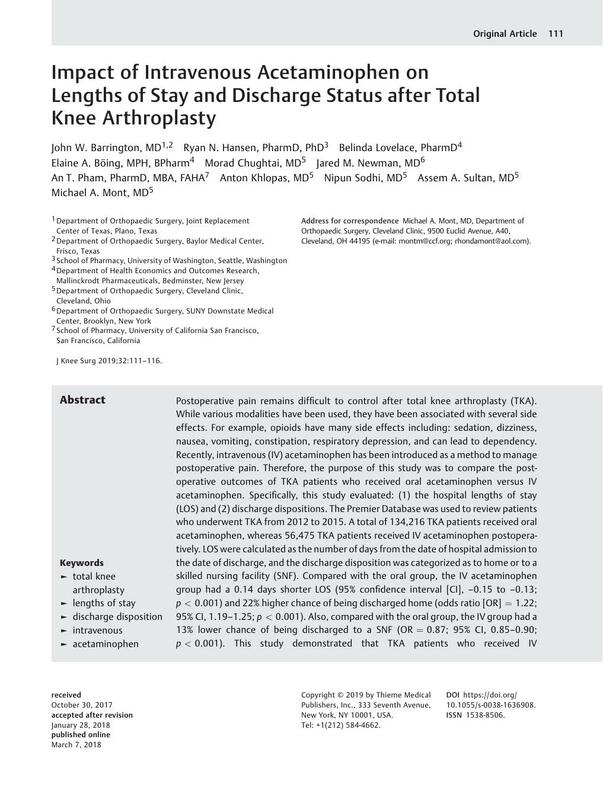 J Knee Surg 2017; DOI: 10.1055/s-0037-1604152.